The military in ancient Hawaiian society was at the same time incredibly advanced and primitive. Chiefs deployed thousands of warriors in large-scale pitched battles, creating a rich and colorful military history. They developed a wide array of hawaiian weapons and tactics that were both effective and devastating. For example, they independently developed pike formations, something that was seen in Western history as late as the American Civil War. However, the Hawaiians did all of this without the use of metal! They used incredible ingenuity to fashion heavy tropical woods into pikes, spears, daggers (including double daggers) and war clubs. They also employed stones in maces. They were amazingly resourceful, using swordfish swords for daggers and sharks teeth on slashing weapons. Perhaps the most interesting weapons they deployed were there trip weapons and strangulation cords. The ancient Hawaiians also wove slings and formed deadly high-speed ammunition from dense volcanic rock. All of this added up to a very unique, and deadly military and exciting history. used a wide variety of weapons. Ancient Hawaiian society was geared towards warfare, it was the most effective way for a chief to gain and hold territory. Warfare was endemic and to support the chiefs in their constant struggles the ancient Hawaiian society formed into a feudal society. Chiefs formed a ruling class and below them were the kahunas, a class made up of priests, navigators and possibly other men of knowledge. Below the kahunas were the common class; these common people were equivalent to serfs in medieval Europe. The lowest class was the slave class; these poor soles were often captives from previous battles and could have the misfortune of being sacrificed to the war god Ku. In battle the ancient Hawaiians employed sophisticated tactics. Battles, when not settled by champions or negotiations, started with a massive missile attack. Slingers and javelins rained down upon enemy units with devastating effect. Ancient Hawaiian pike men formed into dense ranks and presented an enemy with a sharp wall of extremely long spears, just like Alexander the greats Macedonian phalanxes. Koa warriors, named after a tree that their weapons were crafted from, attempted to take advantage of any weakness in the pike formations. These highly trained warriors were the most feared on the battlefield. They trained at night so that others wouldn't learn their deadly marshal art, Lua. Lua emphasized bone-breaking, punching, kicking, wrestling, pressure point attacks and strangulation. 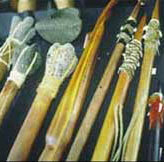 Kao warriors generally carried a large selection of weapons into battle that could be employed at a variety of ranges. For personal defense Hawaiian warriors lathered their body with oil, making them difficult to grip. Nobles wore capes as protection, these consisted of woven fabric with feathers layering the outside. They gripped the cape with their left hand, using it to block missile weapons and enemy blows. They could also whip their opponents with it tripping them before finishing them off with a weapon in their right hand. These capes had brightly colored designs on them, in fact a whole industry centered around collecting feathers for them. Warriors protected their heads with gourd helmets, these were also brightly colored and have become quite famous. 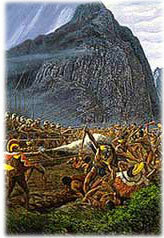 Many consider the Pre-European Hawaiian military to be the last ancient military. However, the term ancient military is usually defined as being a level up from tribal warfare. The difference being in scale, while still using the same basic weapons (bow, axe, spear, ext...) ancient militaries are deployed in armies. After the Hawaiians developed their unique style ancient style of warfare the Hawaiians didn't stop their military development. In fact, the arrival of the Europeans didn't end Hawaiian warfare or even change its trajectory, the Hawaiian chiefs continued their wars of unification. European weapons and technologies were simply added to the armies of the Hawaiians. Cannons, muskets and cold steel weapons were eagerly purchased (a long with the men who new how to use them) by competing Chiefs. This quickened a historic trend of unification through conquest that had been going on since before the islands were "discovered" by Captain Cook in 1778. The islands were finally united under King Kamehameha in 1805, after 28 years of campaigning.